The miniture Sauce painted as a finalist in the Mural Fest Competition. Today at approximately 10:50 am professional mural artist Sauce was escorted by police out of Mural Park for continuing to complete his mural with aerosols. Yesterday he was told he could not continue the competition when he began to use aerosols to start his mural. He tried to reason with the competition organisers, stating the use of aerosol is still using paint to apply the mural, and that no fellow competitors had voiced their concerns for his actions. Sauce says “This competition is not about the art and that’s a shame. I’m happy to be disqualified, but to complete my mural regardless, and not be judged. 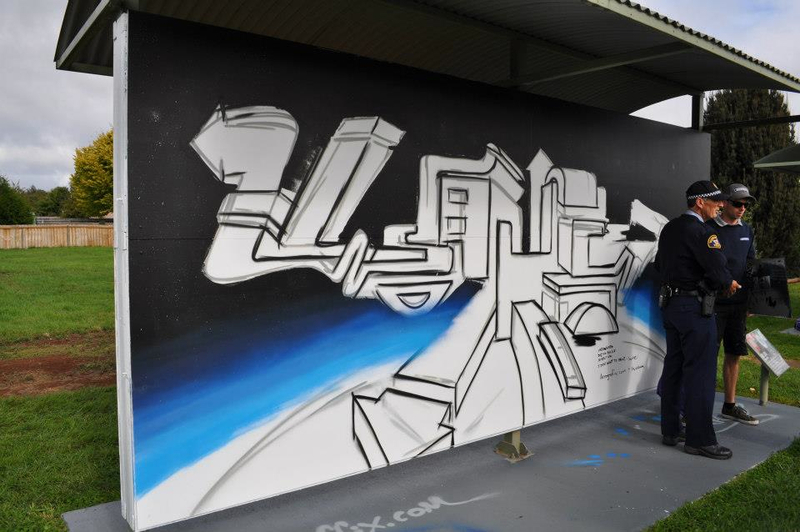 I traveled from Northern NSW to compete, it feel like a waste not to be able to finish my mural”. The event organisers have been adamant that Sauce is not to compete as the rules clearly state all artists must use the paint supplied.